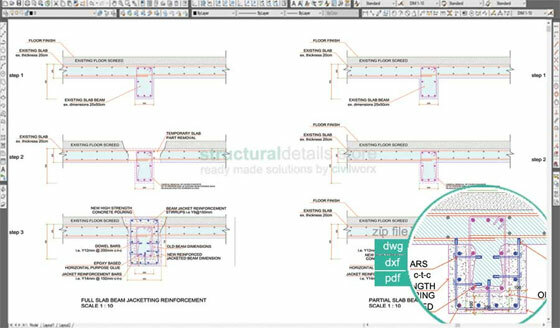 Download extensive lists of reinforced concrete retrofitting / repair / strengthening drawing details which are available in cad dwg, dxf and pdf formats. All the drawings are in 1:10 scale. Seismic retrofitting refers to the alteration of prevailing structures to improve their resistance capacity against seismic activity, ground motion, or soil failure caused by earthquakes. You can apply these drawings in your project and save significant times. This latest tool facilitates the users to include straight bars (Shape Code 00) which are based on complicated surfaces. The bars will produced a complicated shape but stay straight for fabrication instructions. 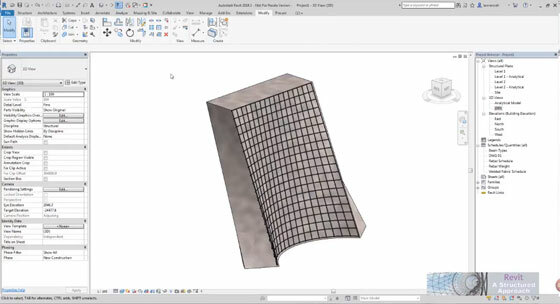 The Freeform Reinforcement tool is applied in a 3D view by initially choosing the host face. This tool applies the Select Multiple option. With the help of space bar, validate the selection. Then, choose the starting surface and then the ending surface and lastly press enter to set the bar. This tool is mostly suitable while going to model complicated Architecture and Civil structures like bridges and tunnels. Each bar should have been scheduled for a precise length. Free Form Rebar can contain any geometry in the form of planar or 3D, and can be utilized for modeling and detailing of reinforcement in complicated 3D structural elements. Rebars are generated at the cover distance out of the intersection of the references which the Revit user chooses. One reference is made with one or more structural element faces. The Surface Distribution rebar type comprises of bars that change among the Start Surface and the End Surface and are circulated along the Host Surface. Free Form Rebar belongs to the Structural Rebar category, and contain all the properties related to it. Free form Rebar can be formed as single bars or rebar sets, rebar quantity for each instance of a Free Form Rebar can be modified easily. Then the rebar constraints can be controlled with in canvas tools in 3D views to organize improved and perfect rebar placement. It is possible to utilize adjustable numbering settings and generate perfect shop drawings with schedules that demonstrate varying lengths in Free Form Rebar sets to make the fabrication better. 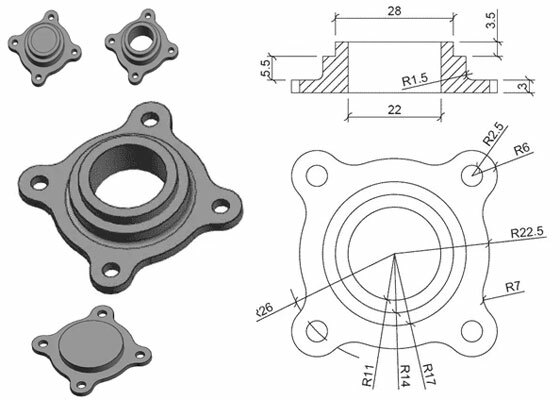 From this autocad tutorial, one can learn how to create a 3d model out of a 2D drawing. With the help of circle command available in draw panel of home tab, produce some circles. Ensure circle having radius 2.5 units retains its center on the perimeter of the circle with radius 26 units. Write J on the command box and press enter then choose the entire geometry and further press enter to combine all outer 2D segments into a single unit. If it is required, iterate the JOIN command various times to connect the geometry entirely. Transform view to southwest isometric and visual style to Shaded from Views and Visual styles panel of Visualize tab. Write PRESSPULL on the command box and click at a location within the geometry, ensure you are clicking within the geometry and not on the geometry. Provide the height of 3 units on the command box and press Enter. This command will include the density of 3 units to the 2D geometry that is already created and your drawing will appear as the image illustrated above. Generate a circle of R17 on the top of the object that was formed in earlier step, but for producing a circle on top plane you have to ensure that dynamic UCS is turned on by pressing F6. Afterward, choose circle command and shift the cursor to the top plane and click at the center of geometry for circle’s center and put a radius of 17 units and press Enter further. 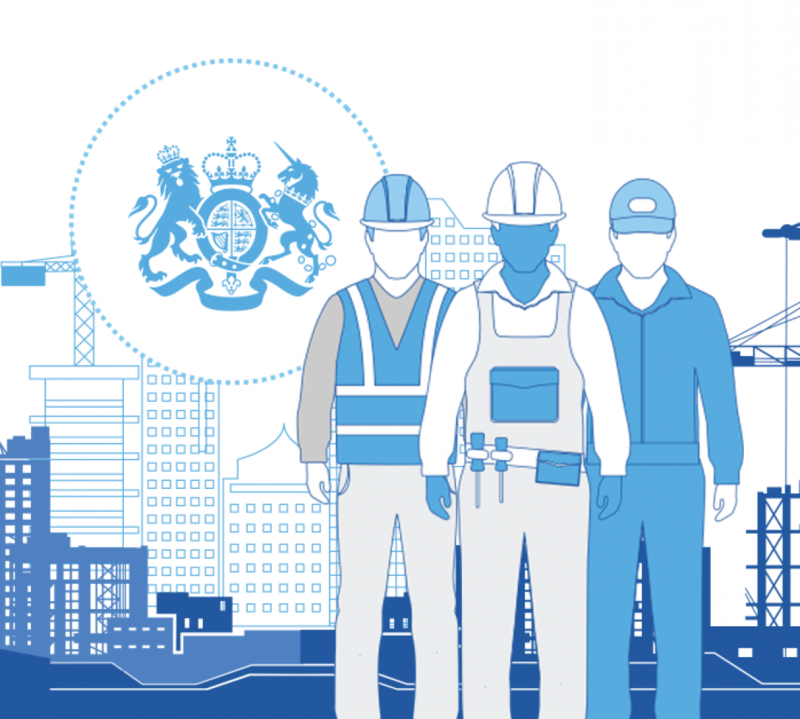 BIM is now commissioned on all government projects. BIM can get lots of benefits ring to your projects. BIM is a captivating technology. It facilitates visualisation and ‘fly-throughs’, and empowers you to explore with the design so as to obtain the optimum possible design for your purchases. Contrary to CAD, BIM employs ‘objects’ like doors and windows, which contain various properties like size, weight, thermal efficiency and quantities associated with them. BIM software helps in updating these objects, and relevant drawings automatically as soon as the design is updated. Application of supplementary software like 4D programming and 5D costing tools will help in making analysis to enhance the project scheduling and financial estimating. BIM improves the efficiency significantly. If your main objective is to curtail costs or fulfill the programme, BIM facilitates accomplishing ‘clash analysis’ in the digital phase, saving significant time on site and reducing the requirement for restructure. • While going to operate the asset, BIM facilitates you to model energy plans to make prediction on the operational costs and authorizes you to acquire a model that can be applied for the asset management stage which comprises of lifecycle data implanted in the models. BIM can also be used for cross-project data analysis, it becomes complicated to obtain data from other sources. • As BIM is a digital tool, it also defies the fundamental norms of organizing a project. For employers, the highest advantages from the BIM application emerge from the design team who are involved formerly than may be the case on non-BIM projects. Autodesk has invented new software Revit 2017 that helps users to create better models and increase their communication and performance skills in the workflow. Autodesk has announced some new key and upgraded features for its main software Revit which is designed for increasing the performance of the software and helping the users to create better models and communicating about the designs. The newest version of this software Revit 2017 is built for the works offered by BIM for the architectural, MEP and the structural engineering etc. The new features in Revit 2017 will be helpful in driving more powerful processes within an increased, multi-discipline BIM workflow. This new software is the fastest and best performing one till now and the new improvements more than 100 functions help the software for keeping up with the most demandable users. It also works faster to display only the visible elements of a view and the hidden drawing elements. Revit 2017 helps in user’s productivity with the various improvements and user-requested updates which simply helps to make the features easier to use. 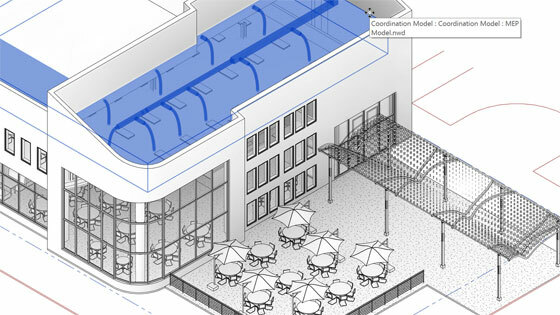 Revit 2017 allows users tools for creating models which can be more precisely and fully represent the things to be built, connect with design and fabrication workflows. The Global Parameters has the features to help in encoding and capturing design that are decided within a model by enabling the users for defining relationships between the building elements. The parameters are used for driving the dimensions and the values in a project. With the help of this software the designers can add the higher level of the detail which is needed for downstream fabrication and building, modeling projects of different sizes and the complexity. The automation of the fabrication model layout and converting design level into the fabrication level of detail elements can be done by the Mechanical detailers. Contractors can prepare their model elements more quickly than before for the detailed coordination in fabrication and installation. The structural engineers also get helpful things from it. As the designers can upgrade the explanation of design intent or the level of detailed for the reinforcement modeling and documentation for the better connected steel design for the detailed workflows. 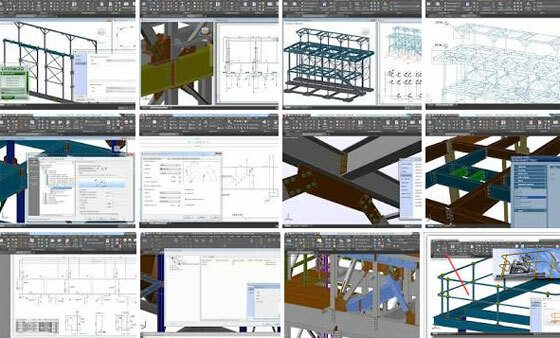 Revit is the base of the active BIM processes for many architects, engineers and construction professionals etc. as they can capture document and share project design data. It is also helpful in the documentation of project’s details more efficiently with the new WYSIWYG Text Editor that has the options for text placements also. It raises the communication abilities in a way that help the users for sharing the data with both Revit and in extended BIM workflows. Data sharing has been simplified within this new software that is improved with new tools for simplifying the reuse of the schedules. Revit 2017 is one of the first BIM tools that support IFC4 and it facilitates BIM interoperability and data sharing within a connected workflow under Revit. Revit also provides the new Autodesk Formit 360 Converter by which users could convert Formit, RFA and SKP files and continue the development in designs in Revit. The collaboration of the Autodesk A360 and Revit 2017 enables the easier use of the acceptance service for project team collaboration with cloud work sharing. The new software of Revit make possible of communicating design with compelling 3D visualizations. It also adds depth and burst to elevations and sections in the coordination views with the new Depth Cueling option. Render with Autodesk Raytracer featuring more accurate settings, video card agnostic and other things more quickly and accurately. After the release of Revit 2017, Autodesk is abandoning some of its software like Autodesk Revit Architecture, Autodesk Revit Structure and Autodesk Revit MEP software by replacing them and providing recent subscribers to each solution. 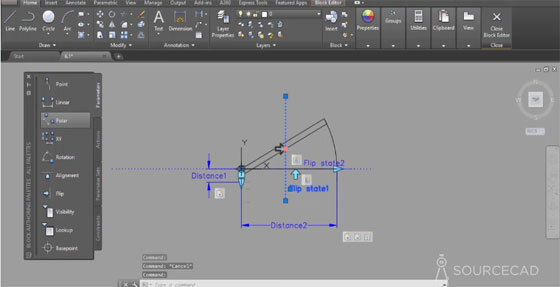 This autocad video tutorial is associated with AutoCAD dynamic block course. By watching the video, one can learn the process in detail to generate a door dynamic block with Flip, Align, Distance and other parameters. It will facilitate the block to be utilized in different circumstances. A dynamic block refers to a block definition that comprises of rules, or parameters necessary for modifying the appearance of the block reference when it is included in the drawing. With dynamic blocks, it is possible to add one block that can adjust shape, size, or configuration rather than adding one of many static block definitions. You author dynamic blocks with either constraint parameters or action parameters. In Advance Steel, the users can use the options to provide a Status level to both the drawing and the model elements and it is often described as Key Stages/Life Cycles inside the production process. The Status system remains as part of the Fabrication data inside Advance Steel, it can contain levels/statuses which are included to it through the Management Tool (MT) System. Besides, comment levels are included to approve the status. Various colors can be arranged while generating anything inside the MT. These can then be applied to provide colourisation/highlighting to the model. It is accomplished with the project explorer and the saved Query Feature. Together with this, there exist a status level for drawings, the drawing system is segregated to the model elements, because drawings may not always remain at the equivalent status as the model, as for instance the model may be left for revision, the elements in the model are updated, but the drawings are not located at similar point. But at some point, they will obtain an adjustment, then a modification in status level of Reissued etc., then modifying to the same status as model at some point. The vital fact is that a “STATUS” level, is not an adjustment to the drawing, it belongs to the present state of the drawing to the overall life cycle to the project, so the two systems are not same, but can be employed in combination to deliver a life cycle management to the system for Autodesk Advance Steel document and model management. To get detailed idea on the different steps and operation, go through the following video presentations.